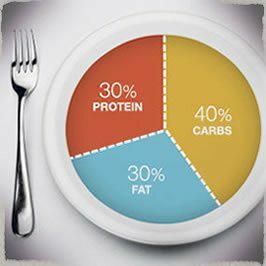 How much carbohydrate, protein, and fat should you be eating each day? Enter daily Calorie goal amount. Select from a number of common diet ratios. Or, put in custom ratios. Select how many meals you eat each day. Results show exact number of Calorie and grams required for each nutrient. If you have figured out your ideal daily calorie intake, the Macronutrient Calculator helps you convert this into grams of food. Food are grouped into Carbohydrates, Proteins, and Fats. Various diet regimes propose different ratios for each macronutrient. Packaged foods have nutritional information posted on them, but fresh foods or restaurant meals have to be figured out manually. However, there are a few great tools that do all the work for you. Have a browse through our food and calorie database. There is a difference of opinion on this. Some feel that only calories count, while others argue that distribution of nutrients is what is important. Some argue that manipulating macronutrient levels is a successful technique for both losing fat and gaining muscle. There is some research pointing to higher protein diets having modest benefits in reductions in weight (over standard low-fat diets). It’s not all about calories. Gary Taubes’ book Good Calories, Bad Calories delves into how our bodies are for more complex than first thought, and processing of fat is not simply about energy intake. His paper "The science of obesity" argues that the energy balance (calories in, calories out) is just a hypothesis. Other research argues that it’s only reduced calories that works, regardless of which macronutrients are emphasized. The reality is – you must find what works for you – and to do this you have to start somewhere! If it doesn’t work – try something else. Here’s a quick look at what the gram values are for some common items. The fat in a Big Mac and Fries can contain enough fat for an entire days intake! The bottom line is to make sure your nutrient ratios are promoting the desired weight loss and having a positive effect on your overall health.